Eckert & Ziegler BEBIG offers a series of reliable products for temporary brachytherapy of eye cancers. The company is the only global provider of Ru-106 (Ruthenium-106) Eye Applicators used to treat ocular melanoma and retinoblastoma. 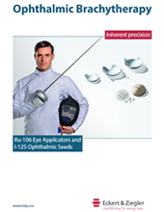 The product portfolio also includes the COMS Eye Applicators used together with the IsoSeed® I-125.